Cast size: 3 to 6m., 3 to 6w. A group of the usual British murder-mystery types gather for a weekend retreat at the sumptuous country estate of the esteemed Lady Somerset. There's the major who served in India; the inebriated, fading actor; the innocent ingénue; the exotic lady in red; the mysterious Chinese gentleman; the rich dowager aunt and her faithful maid and worthless nephew. Suddenly, one of them dies of poison! Well, of course. Oh, what fun! But wait … Her Ladyship refuses to summon the police! She says she won't go through all this, again. All what, again? And why were they all invited here in the first place? Is this actually just another formulaic, all-too-predictable mystery story? Or is it something diabolically … different? Agatha Christie meets Pirandello, as characters rebel against their author. It's bloody murder. "We had so much fun putting this show together! The students were able to really delve in and create fantastic, rich, layered characters. Our audiences were truly entertained. It was the perfect combination of comedy, mystery and suspense." 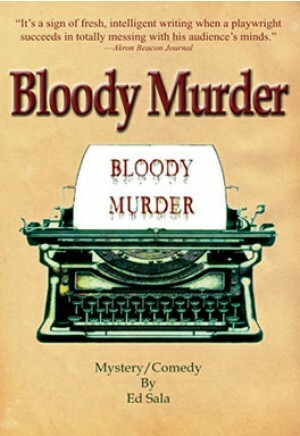 "Bloody Murder was a hit! My students had a wonderful time preparing and performing the show, and it was a delightful surprise to our audience as well. The flexible casting of this script was also a bonus. I produced the 12-actor variation, but the 6-8 actor variation's availablity was comforting."